Welcome to the JCDS Parent Association! When your child enrolls at JCDS you become a member of our Parent Association. We hope that you will partner with us as we strive to build community and support the mission of the school. We have a lot in store for the 2018-19 school year! Our committee chairs for the Fall Family Roundup, Book Fair, and Spring Fling are planning these fun-filled, community-building events for the entire family and they will certainly need lots of volunteers to ensure the events run smoothly. Other committee chairs have started planning for School Picture Day, Yearbook, Vision Screening, Corporate Fundraising, Uniform Consignment, Teacher Appreciation and Field Day. They will be looking for support to plan, run, and supply their events. We have expanded opportunities to volunteer to help our teachers. You can volunteer to serve as a Room Parent, help in the library, or assist in our fine arts or athletics departments. Finally, we hope you will consider helping out with “Celebrate JCDS” our largest event and only fundraiser of the year. This year the event will be held at Top Golf and we need LOTS of parent volunteers to help make it a success. We hope you will share your thoughts and ideas with us at PA meetings this year and that you can find a way, big or small, to get involved in the PA. Most importantly we hope that the events we plan are fun and meaningful for your students, your family, and the school. I am looking forward to a fantastic school year! If you have any questions about the PA please do not hesitate to contact me. Please send any notices, event announcements, or other items you would like included in the Shark Weekly — our weekly school-wide email newsletter — to Parents' Association President, Heather Fouts. Please email the information no later than noon of the Wednesday before it is to be published. Thank you. 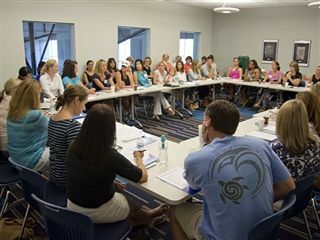 The Jacksonville Country Day School Parents' Association (PA) meets regularly and holds several events during the school year. All parents are welcome to attend PA meetings and all families are invited to PA events. Please mark your calendars and stay involved! Below is a list of dates for the Parents' Association meetings for the 2017-18 school year. All meetings will be held in the Smith Center conference room A at the listed times. All JCDS families are welcome and encouraged to attend the PA meetings. Tuesday, August 28 at 8:30 a.m.
Tuesday, September 25 at 8:30 a.m.
Tuesday, November 6 at 8:30 a.m.
Tuesday, January 15 at 8:30 a.m.
Tuesday, February 12 at 8:30 a.m.
Tuesday, March 5 at 8:30 a.m.
Tuesday, April 9 at 8:30 a.m.
Tuesday, May 7 at 8:30 a.m.
* Please note that all Parent Volunteer training sessions will be held in the library unless otherwise noted.